Thoracic surgeon and scientist Dr. Prasad Adusumilli at Memorial Sloan Kettering (MSK) Cancer Center believes customized gene therapy will soon change the way pleural mesothelioma is treated. Adusumilli, director of the Mesothelioma Program at MSK, has worked for a decade on developing tumor immunology for thoracic malignancies. He is currently the principal investigator of a phase I clinical trial involving specially prepared immune cells — chimeric antigen receptor (CAR) T cells — that have shown impressive efficacy with mesothelioma. Adusumilli presented a preliminary report of his study at the 2018 American Society of Gene and Cell Therapy annual meeting in Chicago earlier this year. Adusumilli singled out a 73-year-old mesothelioma patient who received the CAR T-cell therapy in combination with Keytruda (pembrolizumab), which improves the efficacy and extends duration of this type of treatment. That patient achieved a complete metabolic response. He is doing well now after 16 months, without any further treatment. As part of the clinical trial, which also includes lung cancer and breast cancer patients, five others with mesothelioma received the same combination. Two had a partial response, one had stable disease, and two had progressive disease. All were still alive — between 25 and 68 weeks — of starting treatment. None had any serious side effects, which is the primary measure of a phase I clinical trial. Gene therapy involves the laboratory reprograming of a patient’s own T cells. It removes the cells and arms them with a protein aimed at a particular target before returning them to the patient. Dr. Prasad Adusumilli and his team at Memorial Sloan Kettering Cancer Center believe combining CAR T-cell therapy with immune checkpoint inhibitors may be the winning combination in the fight against mesothelioma. CAR T-cell therapy works by helping a patient’s own immune system to better recognize and destroy the cancer. The target, in this case, is mesothelin, a cell-surface antigen that is expressed in 90 percent of mesothelioma cases. It is also expressed in 65 percent of lung cancers and 85 percent of pancreatic cancers. The U.S. Food and Drug Administration approved the first gene therapy for pediatric leukemia in 2017, providing the official opening for a new approach to cancer care. Gene therapy has been showing great promise with blood cancers, but its effectiveness with solid tumors such as mesothelioma has been slower to develop. 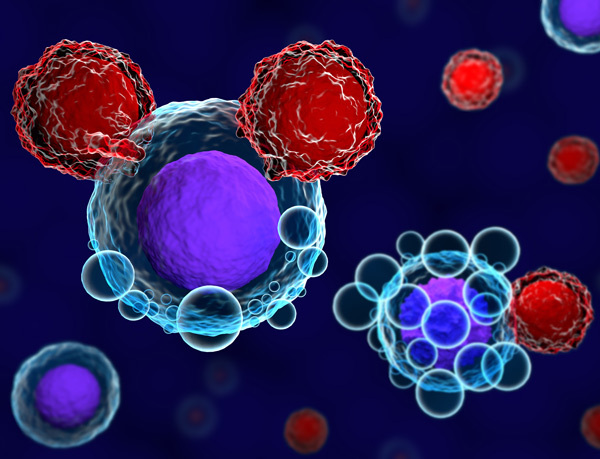 “We provide the first clinical evidence that combination immunotherapy with CAR T cells, followed by anti-PD-1 agents [Keytruda], can elicit responses in patients with hard-to-treat, therapy refractory solid tumors,” Adusumilli said at his presentation in Chicago. Illustration of a CAR T cell targeting an antigen on a cancer cell. Adusumilli is currently recruiting mesothelioma patients for this phase I trial. It is designed to establish the most-effective, safe-dosage levels of the modified T cells. His research group found the genetically-altered immune cells wear out and stop working against the thoracic cancer unless they can be reenergized by a drug like Keytruda, which is also known as an immune checkpoint inhibitor or anti-PD 1 agent. They also have seen that intrapleural administration of the drug combination is considerably more effective than IV administration. Adusumilli was the senior author in a previous, animal-model study involving the same T cell combination. It showed the potential to induce complete, long-term remission. Adusumilli, head of Solid Tumors Cell Therapy, Cellular Therapeutics Center at MSK, leads a laboratory that focuses on tumor immune microenvironment. Tim Povtak is an award-winning writer with more than 30 years of reporting national and international news. His specialty is interviewing top mesothelioma specialists and researchers, reporting the latest news at mesothelioma cancer centers and talking with survivors and caregivers. ClinicalTrials.gov. (2018, September 11). Malignant Pleural Disease Treated With Autologous T Cells Genetically Engineered to Target the Cancer-Cell Surface Antigen Mesothelin.